Join the discussion on our forums! Come discuss Sweeping Strikes over in our dedicated Sweeping Strikes discussion topic. If you stick this on Akali, the Rhino and kill overkill 3 different minions, will you draw 3 cards? 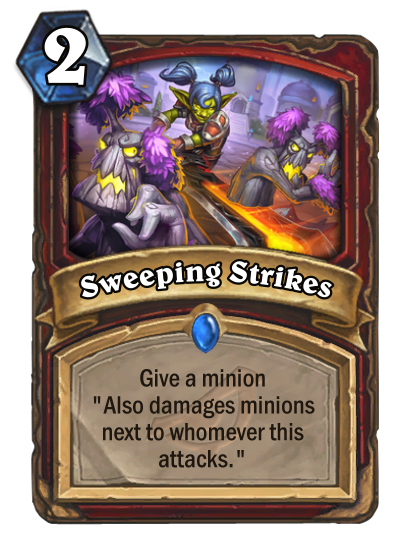 We need to test how it actually works: when you attack and your minion under this spell dies, will the adjacent enemy minions still be attacked? Yes. It deals the damage to all minions before it dies, like Cave Hydra does. This is the board control warriors always wanted. Lots of potential, the most obvious being Militia Commander; less so a cheap Poisonous minion + something that gives it Rush. Amazing card. Works very well with Warrior’s Rush minions, as well as Zilliax or the new Scraphound.